During the period of Ramadan, Muslims abstain from food & water during the period from dawn to dusk. However, the fasting period does not necessarily warrant a "non-exercise" philosophy. Here are some guidelines which you can use in order to continue to stay trim, fit and safe as you workout during Ramadan. The best time to hit the gym during Ramadan is either early in the morning (after your first meal of the day) or after sunset (45 min to an hour after your first meal post fasting). Inclusion of foods containing simple sugar would be an excellent choice for raising the blood sugar level and ensuring that you would minimize the risk of fainting spells due to low blood sugar during your workout. Ensure that both your Ramadan meals contain easily digestible protein such as eggs and nuts. Do not start any new goals during Ramadan as it would be hard to achieve them. Workout duration during Ramadan should be kept very tight. Get in and out of the gym or finish your regular exercise schedule in less than one hour and preferably aim for 45 minutes. The rest interval between sets has to be increased by 20-25 % if you do not want to over-tax the body. Hydrate yourself well during the period when you can drink water. 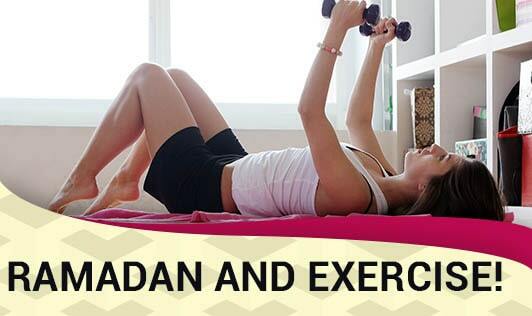 The period of Ramadan is indeed a critical time for proper nutrition and exercise. Finally, I would like to wish all our Muslim readers a blessed Ramadan.